Private Miller: I feel like a slice of butter melting all over a big ol’ pile of flapjacks … yeah. I’m pretty sure my mother always told me that smoking pot was bad for you. She’s my mother so, naturally, I always believed her. Now, I’m not so sure though. She couldn’t possibly have seen PINEAPPLE EXPRESS before making this assertion. If she had, then she would know that smoking only leads to hilarity and kinship. At least that is one of the many valuable life lessons I learned while watching the latest Seth Rogen vehicle to come off the Judd Apatow assembly line. I also learned that paranoia can be a very good thing, that friends who smoke together stay together and that James Franco actually has a drastically different side to his usual stoic, dry presence. I think most importantly though, I learned that stoner movies, when they’re done right like this one, don’t require the audience to smoke up heavily beforehand in order to have a good time. Albeit, I’m sure a whole other kind of good time would be had if you did. You could see this movie as an opportunity for Rogen to push his pot smoking agenda onto unsuspecting youths that think of his as some sort of demi-God after last year’s one-two punch, KNOCKED UP and SUPERBAD, or you could just drop the act and enjoy the trip. Besides, smoking is hardly over glorified in this film. Every time Rogen, as Dale Denton, a crafty process server, lights up, he finds himself in a whole heap of trouble. He makes stupid mistakes that lead to his deeper and deeper into despair. And while watching Rogen alone is certainly entertaining, watching him get goofy with a buddy is even better. The buddy here is the unexpected Franco. Franco plays Saul Silver, the drug dealer to Dale’s drug doer. Get these two in a forest and give them a little herbal amusement and there is no telling how stupid they will get and how far out in space their minds will go. There is one sure thing though, weed brings these two together and their lives are better for it. Thank goodness these two have each other because they could never endure what they need to go through all alone. 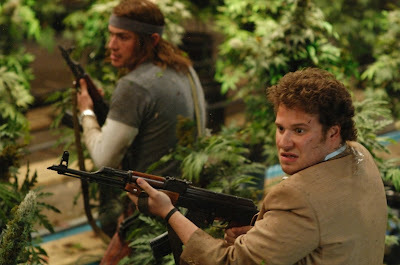 Saul sells Dale some of his highest-grade bud, called pineapple express. It’s so rare, so exclusive, that after Dale witness a homicide and dumps his roach at the scene, he believes that it can be tracked back to him. Saul must then get involved as he is the sole distributor of pineapple express and therefore the whole thing can be traced back to him. In order to get out of their unfortunate bind, the two must go to the source and get the bad guys, including a feisty Rosie Perez as a crooked cop, before the bad guys, and gals, get them. 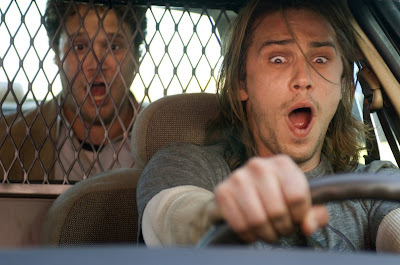 Many a stoner has inhaled and embarked on zany adventures before these two but how many find themselves in high speed car chases or live-or-die bang-up’s or even fleeing scenes of explosive proportions? Well, I can’t say actually but I can say that none have been this funny in what feels like a very long time (what feels even longer if you actually are stoned). Dale and Saul are the new stoner buddies, the new Harold & Kumar, if you will. They are accidental action heroes whose pot smoking both gets them in and out of trouble. 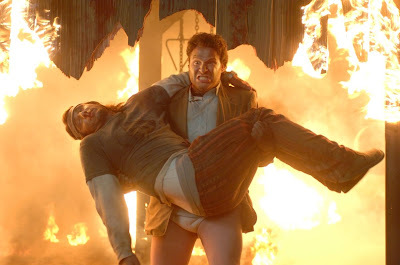 Unlike the punks responsible for the most recent Harold & Kumar disaster, the people behind PINEAPPLE EXPRESS are actually interested in making a solid film, one with an engaging story and consistent character development. Director David Gordon Green (SNOW ANGELS) knows that just because his characters are stoned out of their heads 99% of the time does not mean his audience will be necessarily. The audience might want to shut off and have a great time, either naturally or enhanced naturally, and that does not mean that you don’t actually have to try. When I want to shut off, I like to be around good people and let the laughs roll. Watching PINEAPPLE EXPRESS is like hanging out with the guys and I already want to hang out with these guys again next weekend. I didn’t think this movie was all that great. It was a lot more violent than I was expecting.